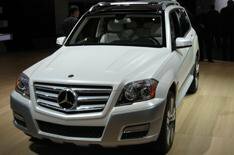 Mercedes GLK | What Car? Mercedes has already made it clear that the four-wheel-drive version of the Audi Q3, BMW X3 and Land Rover Freelander-challenging GLK will not be coming to the UK, because of complications moving the four-wheel-drive system around to fit a right-hand-drive car. However, that doesn't mean you should cast it from your mind, as a rear-wheel-drive version of the GLK is said to be in the pipeline, which could be made UK-compliant with far greater ease. Two models were presented in Detroit, called the Vision GLK Freeside and Vision GLK Townside. No prices for guessing that the former is built for use on all types of terrain, whereas the latter is for those who intend to stay on asphalt. Mercedes insists both Vision models are concept cars, rather than the real thing. Cast aside the large 20-inch alloys, though, and you are almost certainly looking at the production cars. Both are powered by a new 201bhp 2.2-litre turbodiesel with Mercedes' Bluetec emission control system, which reduces nitrogen oxide output, and each car has a seven-speed automatic gearbox. However, more potent V6 petrol and diesel engines are expected to be available from launch of the GLK later this year, and an AMG-tuned 6.2-litre V8 may follow in 2009.